for best results you should use the MH-C490F which is designed specifically for these batteries. NiCd batteries can usually be charged with a NiMH charger. Lithium batteries must be charged with a lithium charger. Unlike old 9V battery chargers, the MH-C490F charger can charge 1 to 4 8.4V and 9.6V batteries within 2 hours. No more waiting overnight to have the batteries fully charged. 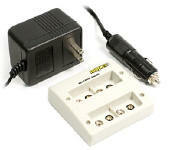 Unlike old 9V battery chargers, the MH-C1090F charger can charge 1 to 10 7.2v, 8.4V and 9.6V batteries within 2 hours. No more waiting overnight to have the batteries fully charged. Smart LED display.